﻿With Valentine's Day around the corner, what better way to treat your loved one than a simple heart felt breakfast in bed. 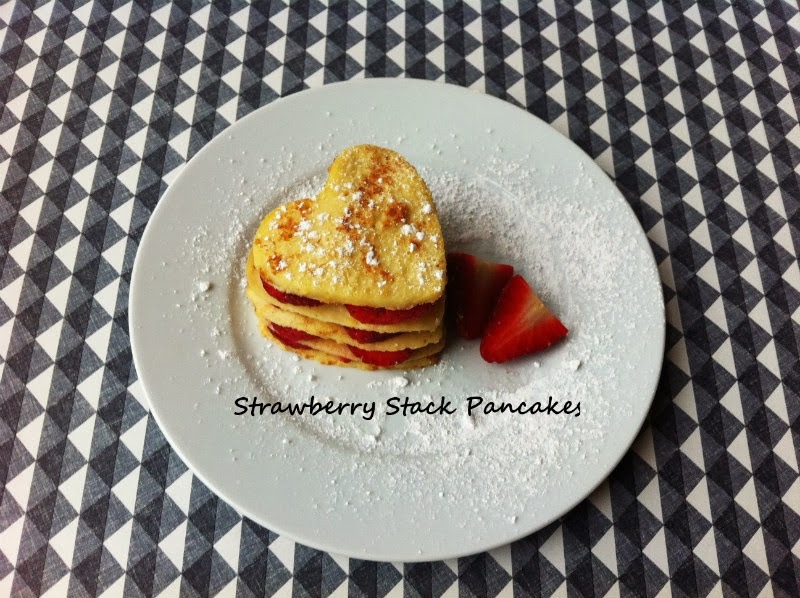 These quick and easy Valentine Strawberry Stack Pancakes taste as good as they look, with fresh strawberries stuffed between layers of heart shaped yumminess. 1. Sift the salt and flour into a large mixing bowl. 2. Make a well in the centre of the flour and break your eggs into the middle. 3. Whisk the eggs, flour and salt together and slowly add the milk into the mixture while whisking. 4. Whisk until the batter is smooth and there is no flour left in the bowl. 5. Melt the butter in the frying pan. 6. Pour most of the melted butter into the batter mix leaving a little in the pan and stir butter into the batter. 7. Pour in a small amount of batter (3 tablespoons) into the centre of the pan and tilt the pan to spread the batter evenly. 8. After a minute - when the batter has turned golden - use a spatular to flip the pancake over. 9. Cook again until golden and transfer to plate. 10. Repeat steps 7-9 to make another 4 pancakes. 11. Cut as many heart shapes as you can from each pancake and keep the hearts to one side. 12. Move the first heart pancake to a serving plate and layer the sliced strawberries on top. 13. Alternate layering strawberries and heart pancake slices on top of each other. 14. Dust lightly with icing sugar or drizzle with honey and use fresh strawberries to garnish. Oh yummy!! I love pancakes and love hearts...what a great combination!! Delicious! oo I love pancakes so much! (I just posted a recipe too!) In our house it's our birthday breakfast meal, but I would love to get them in bed in the morning! mm pancakes! also loving the backdrop too. is it a tablecloth, or just a piece of fabric?